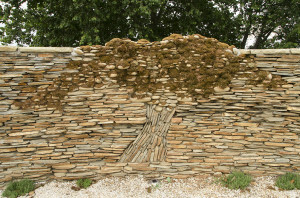 Our fantastic garden area has a fascinating history and is a meaningful on-going project for many of our community. Beginning in 2012, Jessica Tripp originally had the idea of designing the concrete walkway in the shape of the infinity symbol, three interconnected circles. After getting input from Hunter Stubs of B.B. Barns, they decided to change the shape to the Icthus (the fish symbol used by early Christians). Jessica then suggested that a prayer wall be built at the tail end of the fish, and a reflection circle be built at the mouth. 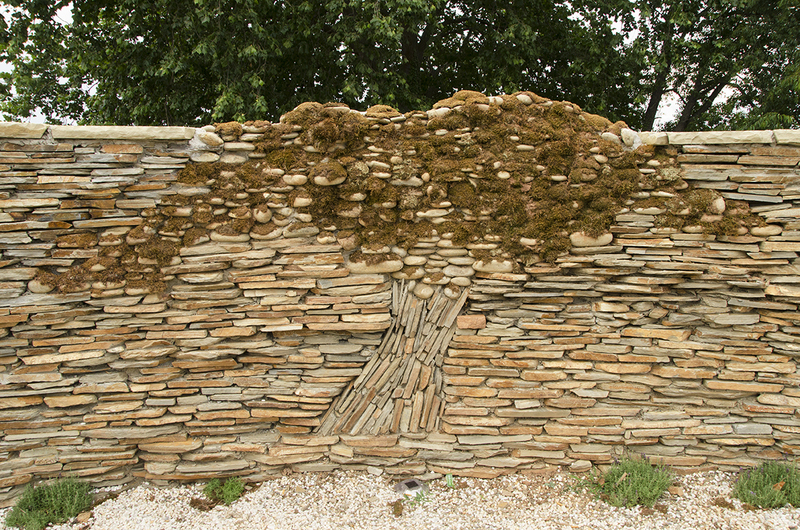 “It was fun designing the river stone tree in the wall,” said Jessica. Hunter Stubbs led in the actual construction of the walkway and the wall, with the help of Chris Smith, of Beverly Grant Construction, and volunteers from Central UMC. 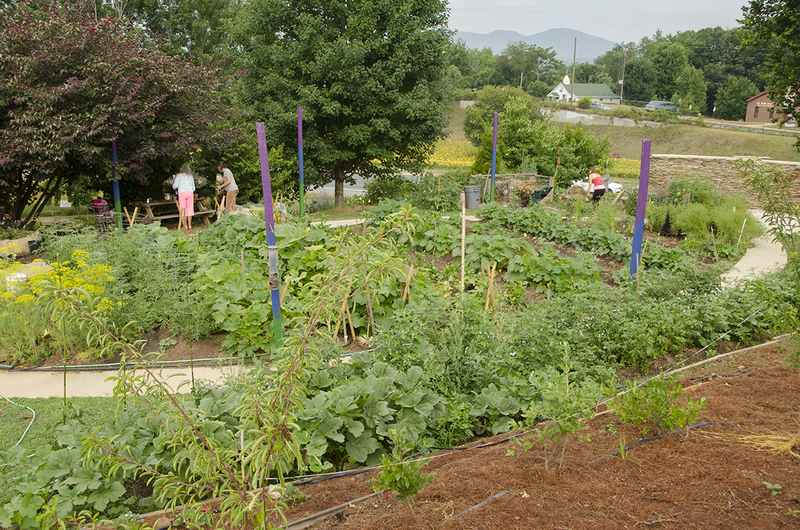 Laura Kirby adds the following: “Organizers of the Love and Fishes Bountiful Garden like to say it started ‘On the Fly’ — with little planning but lots of passion and energy. Sarah Robinson and Lynne Michael were co-leaders of a weekly fiber arts group for the area homeless at the Haywood Street Congregation in 2012. Lynne and Sarah watched as Haywood Street’s garden space was transformed from a rough rectangle full of red clay to a beautifully designed fish-shaped garden with sidewalk borders and a rock prayer wall at one end. The two waited and watched to see what would be planted, and nothing was. As the spring growing season began to slip away, still nothing. They inquired and were told that volunteers had plans to transform the garden plot into something beautiful, but no plans for planting or resources to purchase seeds. 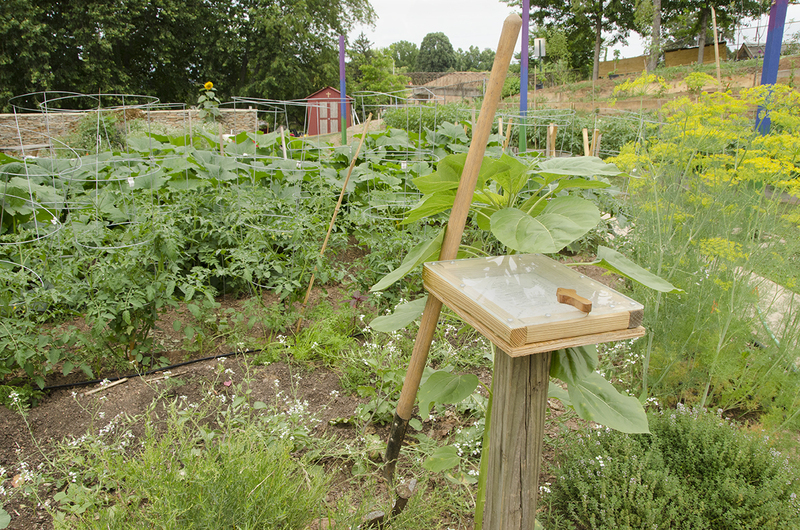 Lynne and Sarah teamed up with Mary Anne and others who had an interest in growing, and new life — and a new name — came to the Haywood Street garden. ‘The Love and Fishes Bountiful Garden’ was born. “Garden Team members reached out to the local community and within a week had donations from Reems Creek Nursery of seeds and plants. 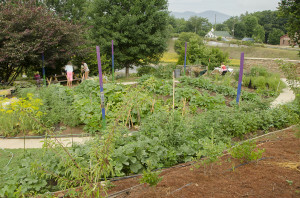 The Buncombe County Extension Office responded with “people power” and financial support. During the first meeting seven Master Gardeners came ready to offer assistance. Mary Anne, Sarah and Lynne were over whelmed with the commitment from these folks to help groups develop community gardens. Each week there were at least two Master Gardeners helping. They advised on how to structure gardening practices to achieve a successful harvest. We are most thankful for their continued support.